Today I made the most amazing pound cake. The plan was to bake this delicious cake for a get-together we had planned for Friday with my family, and bake another for a luncheon on Saturday with my in-laws. Then a third one for my Dad when he comes down from Charlotte. But today, the pediatrician suggested we stay home, as the bug the kids have is quite nasty. She said to stay away from elderly folks, and babies. Both of which we would have seen this weekend. So we have cancelled our plans, and will be staying home to rest and recuperate. I decided to go ahead and bake one of these to send to Randy's office for them to enjoy. Oh. my. gosh....it is oh-so good!! The recipe came from Daphne Oz on The Chew, which is my favorite daytime show ever! They have great recipes, tips, and more - and the hosts have such amazing chemistry together. Do y'all watch it? Anyhoo - back to this fab recipe: I tweaked it a tiny bit by adding some vanilla extract to both the cake and the glaze, but will probably try it with almond extract next time I make it! It's moist in the middle, crusty on the outside, and deliciously glazed on both top and bottom - seriously delicious, y'all! Prehat oven to 350 degrees. 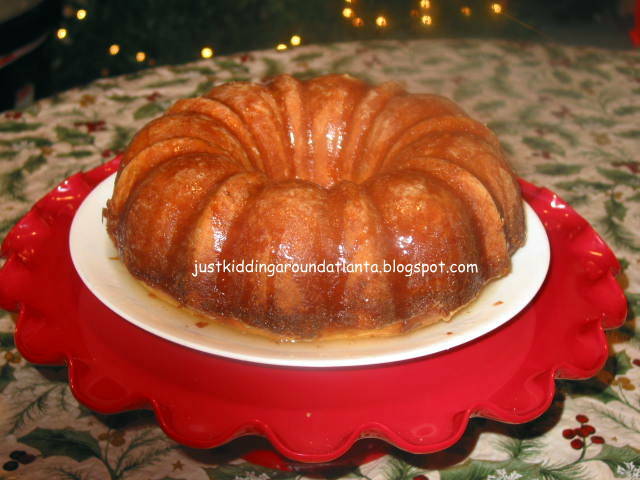 Grease and flour bundt or other pan. In a large bowl, combine eggs, sugar and butter and beat with an electrical mixer until light and fluffy, approximately 3 minutes. In a separate bowl, combine flour, baking powder and salt. Add dry ingredients alternately with buttermilk in three parts to batter, mix gently until just moistened. Stir in coconut and pecans. Pour batter into cake pan, bake for 60 minutes, or until knife inserted in the center comes out clean. Five minutes before cake is finished baking, make the glaze. Combine water, butter and sugar in a saucepan and bring to a boil. Reduce heat, stir well and cook for 5 additional minutes. Remove from heat, and stir in the vanilla extract. Slowly pour half of the syrup over the cake, invert cake onto serving plate. Pour remaining syrup over the top and sides. Can dust top with confectioner's sugar or serve as is - let it sit for at least 10 minutes, serve warm!! I hope to have another Christmas treat recipe up tomorrow, or Friday at the latest - sorry for the sporadic blogging, but sick kids and too many holiday plans have kept me hopping! 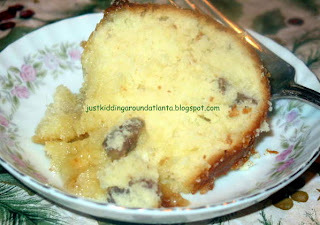 sweet, gooey goodness on the bottom, a crusty top and side, and moist cake in the middle. Coconut was in almost every bite, with the occasional chunk of pecan. Absolute perfection!! In trying to locate Daphne Oz's recipe for the layered banana pudding she just made on Friday I came across your page. I noticed that you wrote the pound cake recipe during winter flu season and everyone in your family was sick. I want to make a helpful suggestion and you don't know me, but having been through over 76 years already, and a widow with 13 grandchildren I think I have some good credentials here. Anyway, try not giving your family any sugar (What? Horrors!) No, you'll find far less sickness in the family if you do that. I wasn't going to make the pudding because it has sugar in it! I too love "The Chew" and it is my favorite on TV.